Hello, RT readers. My name is Dave Yeager, and I'm the new editor of RT. As we noted in our previous issue, the sudden passing of longtime editor Jim Knaub shocked and saddened all of us here at Great Valley Publishing. Jim was a terrific editor, as well as a mentor and friend. He hired me 10 years ago as an assistant editor, and I've been writing for the magazine ever since. I learned most of what I know about journalism from Jim, and it's now my job to step into his shoes. They are big shoes to fill, and it will take time to grow into them. I have no doubt that, in the weeks and months ahead, Jim's example and the knowledge he imparted along the way will be a big help to me and, although those are poor substitutes for the man, I consider myself fortunate to have them. Jim planned and edited this issue; it reflects his keen eye for interesting stories and boundless curiosity for new trends. Our cover story, by Beth W. Orenstein, looks at multipurpose imaging systems and how they can help imaging centers and radiology departments save valuable space. Industry experts believe such systems have a chance to significantly impact operations. 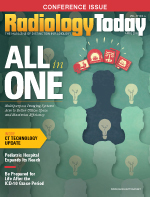 Also in the issue, Keith Loria looks at advances in CT technology that can help practices manage patient care and allow doctors to make diagnoses with lower radiation doses. Kathy Hardy reports on the new pediatric imaging center and cutting-edge facilities of the Children's Hospital of Philadelphia. And Jeannette Sabatini shares expert insight on the first six or so months of ICD-10 implementation and offers several tips that will help keep things running smoothly at your radiology practice. In the issues to come, I will do my best to meet the standard of excellence that Jim established and to keep bringing you the great articles you're accustomed to. If you have any suggestions for topics you'd like us to cover, please feel free to get in touch with me.